Warning, this book will keep you up at night. It is a fantastic read, with an antagonist as scary as a certain Mr Lectar. With the investigation quickly gathering momentum, Kim soon finds herself exposed to great danger and in the sights of a lethal individual undertaking their own twisted experiment. Up against a sociopath who seems to know her every weakness, for Detective Stone, each move she makes could be deadly. As the body count starts to mount, Kim will have to dig deeper than ever before to stop the killing. And this time - it’s personal. 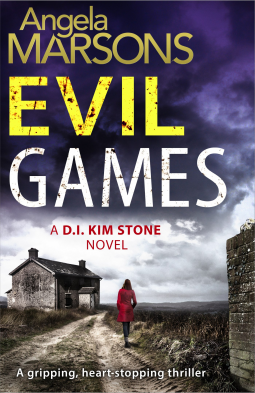 The character of DI Kim Stone, who I just love, is developing more and more with each book. Ably assisted by DS Bryant, she is one lady I wouldn’t like to get on the wrong side of. Her antagonist in this novel is Doctor Alexandra Thorne, another fabulous character who is so evil she gave me chills. A dangerous sociopath, she makes it her business to delve into Kim Stone’s past in an effort to find her Achilles heel and destroy her. This is truly an evil woman, and she’s brilliant. This book takes you on a wonderful, unnerving ride. Full of twists and turns, the action never stops. This is the second book in the series, Silent Scream was the first, but it can be read as a standalone. Silent Scream was great, but, in my opinion, Evil Games is better. It is definitely going into my top five books of 2015. A definite 5* read, and thoroughly recommended.